The first one he lost freaked him out a bit. The second one he lost got so wiggly that it fell out when he jumped into the pool last summer. He had to write a note to the tooth fairy to see if she could find it in the pool. 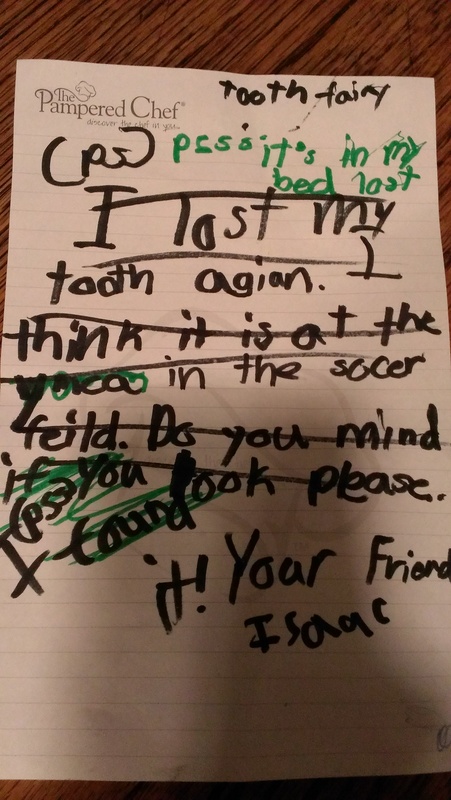 She wrote back that she did find it but would not go looking for anymore teeth. The third one got so wiggly that it almost fell out when he went to get his teeth cleaned at the dentist. Good thing it didn’t actually fall out… we have crappy dental insurance and probably would have had to pay for an extraction or something. The fourth one was hanging by a thread and sticking sideways. it was so gross that the hubs and I conspired to pull it out while he was sleeping. Good thing it didn’t come to that. He knocked out while brushing. Apparently, he lost another one last week. Saturday morning, we woke up to him complaining that he had written to the tooth fairy but she still hadn’t shown up. But alas, it did not stay found for long because the note is updated again in green ink: psss it is in my bed lost. The hubs and I knew nothing about any of this and thus were unable to alert the toothfairy to pick up said tooth. Saturday morning came around and Dude was not happy. I am pretty sure Bubba is starting to figure things out about who the tooth fairy really is and this may have sent him over the edge of non-belief. (he is on the fence about all of the guardians (santa, tooth fairy, easter bunny, etc) because he is super logical and none of it makes sense without a strong imagination but he is afraid to not believe in case it is all true). Anyway, Dude brought me the note and explained everything to me. 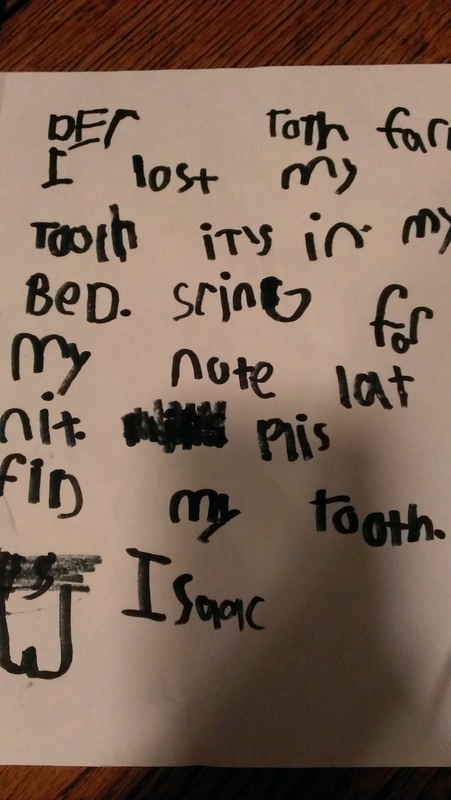 The only thing I could come up with for why she hadn’t shown was that his note was super confusing and the tooth fairy didn’t know what he was talking about or where to look for the lost tooth. I told him we should probably rewrite the note and he asked if I would send her a message on facebook (because that is how a kindergartner thinks you should get a hold of the tooth fairy). Are your kids afraid of losing teeth? Have they ever had to write the tooth fairy a note? Little bunnies hopping around laying eggs. Such a bizarre tradition. I have no idea where it started but the one thing I love about it is that the Easter Bunny always brings Cadbury Creme Eggs. This seems to be the most divisive of all candies (black licorice and black jelly beans might be more bring more division but I am not sure). I have heard terrible things said about my beloved Cadbury Creme Egg. I don’t understand the haters. Oh the milk chocolate egg. So soft and melty. Oh the creamy soft fondant center. I can’t even begin to describe the delicious taste. The hubs admitted to me that he had never had one so I shared the goodness with him tonight. He took a little bite and responded “it’s alright,” as he handed it back. That is his polite way of saying it was gross. I hope our relationship can withstand this split on our culinary path. At least I can say more for me although my pancreas might be able to keep up with my blood sugar spikes. My dear Cadbury Bunny it is probably a good thing you only lay your eggs once per year. On which side of the egg fence do you sit? Have you noticed all of the online quizzes going around lately. I loved them and get sucked into them easily. They all ask the same basic questions. *I am Audrey Hepburn (although, I think this is the only answer to this one- either that or all of my friends on facebook answered the same way). Tonight I got sucked into to taking more quizzes and I learned that I most identify with the musical character Oliver. Heres what playbuzz.com had to say about me: You are loud, confident and very bubbly. People sometimes mistake you as being cocky but you are just a very fun-loving person. You like a bit of drama in life and love finding out gossip from your friends and family. You are very stubborn and can hold a grudge but thats probably because you don’t like seeing your family or friends getting hurt. Keep smiling because that cheeky grin is what you do best. I am pretty sure this isn’t accurate but who knows… maybe a 10 question quiz knows me better than myself. I found out my nickname should be Dottie because “like freckles, polka dots, or sprinkles, you are totally cute!” You may now address me as Dottie! I need to listen to that last sentence. Keep being amazing. I might make that my mantra and start telling my students that, too. So to you, my dear reader, keep being amazing!! !